The United States fought back from a goal down three separate times to force their Olympic semifinal to extra time against CONCACAF rival Canada. A stoppage time goal from Alex Morgan in the second overtime earned the Americans a berth in the gold medal match in a game that will be talked about for years. Canada put the pressure on the Americans behind a hat trick from Christine Sinclair and, despite the loss, have proven themselves as a force to be reckoned with in the women’s game. The Americans came out ready to play in this matchup, playing high pressure from the start, causing turnovers in the Canadian midfield. They created numerous opportunities on goal, but they struggled to connect on the final ball. This match began with a frenetic pace, and it would only increase from there. The Americans had some opportunities early on free kicks, which would be an indicator of the physical game to come. 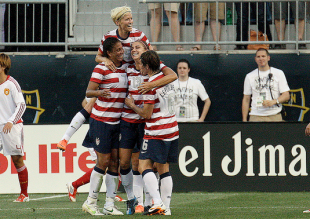 The first opportunity came off a Carli Lloyd free kick in the second minute. Instead of taking a shot, Lloyd played the ball to the left of the wall to the far post. It was a clever ball, but there was no one on the other end of it. Megan Rapinoe also got involved in the attack early, playing a dangerous cross in from the right side in the fourth minute, but Canadian goalkeeper Erin McLeod came out to punch it away. The US dominated possession in the first twenty minutes of the game, with Canada’s only real chances coming off a corner kick and a free kick. However, they would be the first team to strike. In the 22nd minute, Abby Wambach was unable to keep possession of a ball played out of the back by Christie Rampone. Left back Eve Nault found Melissa Tracredi, who had slipped between central defenders Rampone and Rachel Buehler. Trancedi cut inside with the ball, and then found Sinclair at the top of the box. Sinclair collected the ball, took a touch to the right around US defender Kelley O’Hara, and then beat Hope Solo. The US back line displayed a lack of communication in failing to pick up both Trancredi and Sinclair. The US responded by continuing to put pressure on the Canadian defense and their next good chance came from a Rapinoe free kick in the 31st minute. Alex Morgan was able to get her head to the ball to redirect it, but she missed just wide of the goal. They had another excellent chance in the 37th minute when Morgan collected a ball down the right side. She connected with Wambach near the penalty mark, but the diving header again missed wide. The US continued to press for a tying goal as the half died down. In doing so they forced the ball forward too often and gave the ball away with long balls out of the back. Their best opportunities came when they worked the ball through the midfield and were able to find Tobin Heath and Rapinoe on the wings. The US came out hard again at the start of the second half, eager to get the tying goal. The first good chance came in the 50th minute on a feed from Morgan. Wambach controlled the ball with her chest, and took a tough left-footed volley that went over the goal. The US would get the goal they were looking for on a corner in the 54th minute. Rapinoe played a hard, driven ball directly at the near post. Buehler attempted to get a touch on the ball, and in the chaos in front of the goal, it squirted by two defenders and the goalkeeper. Rapinoe was credited with the goal, which shows that good things happen when you put the ball in front of goal. The US controlled had the majority of possession after the goal, and looked eager to get a second. The Canadians had other thoughts, and put themselves ahead once again in the 67th minute through the combination of Trancredi to Sinclair. Trancredi took a hard cut back on the left side, and Rampone gave her too much space to pick out Sinclair in the middle of the box. O’Hara lost Sinclair for a second, and that was all she needed to head home her second goal of the day. The US responded quickly with Rapinoe’s second strike of the day only two minutes later. O’Hara played a great ball across the field to Rapinoe near the top of the right side of the penalty area. She settled the ball and was given enough space to fire a powerful right-footed shot that deflected off the far post before settling in the back of the net. The US seemed to swing the momentum back into their favor behind Rapinoe’s second tally of the day, but would again be undone by Sinclair three minutes later, this time when she connected on a header off a corner kick. She simply outjumped Buehler, her defender, and her header beat the post defender Amy LePeilbet. The Americans found themselves down a goal again, and Coach Pia Sundhage elected to adjust her formation to further push for the tying goal. Sydney LeRoux, who had put the game away in the quarterfinal against New Zealand, replaced LePeilbet, and the US changed to a 3-4-3. Controversy entered the match in the 78th minute when the referee awarded the US an indirect kick in the penalty area after she whistled the Canadian keeper McLeod for holding onto the ball too long. While it was difficult to see how long she held the ball, there was at least one play earlier in the half where McLeod held onto the ball much longer than the allotted six seconds. If the referee warned her discreetly earlier in the match about her time with the ball, then the call is justified, even if it is rarely made. On the ensuing free kick, Megan Rapinoe fired her shot off the arm of a Canadian defender. The contact on the arm was not intentional, but the referee determined that the arm was away from the body, and awarded the Americans a penalty. Wambach connected on the penalty to once again tie the game. Despite tying the game up, the US continued to play with three defenders, electing instead to push for the winning goal, a decision that resulted in a few chances for Canada in the waning minutes of regulation. Kaylyn Kyle was sprung loose on the left side, but she took a weak shot on goal that was easily collected by Solo. Sinclair expressed her frustration as she had gotten free in the penalty area and was looking for the cross. Both teams pressed for the winning goal, but they came up short, and the match was on to overtime. Sundhage decided to stick to the same 3-4-3 formation that the team finished with in regulation and the lineup allowed the Americans to continue to create dangerous chances up top. It did not come without risks though. Throughout the overtime period, the US lost the ball in the midfield, and were vulnerable on the counterattack. Sundhage added another threat in the midfield when she replaced Lauren Cheney with Heather O’Reilly in the 101st. The change pushed Heath into the attacking center midfield role with O’Reilly moved to wide right. The US had the majority of the opportunities in the first overtime period with their chances coming off of crosses from their outside players. Still, they could not finish the decisive moment. Sundhage made her final substitution in the 110th minute, replacing Buehler, who had come up lame with a cramp, with Becky Sauerbrunn. This was a smart change because Buehler was laboring and Sauerbrunn was able to add more pace to the three-man back line. The United States continued to create most of the scoring opportunities, and they would be rewarded in the final minute of stoppage time. In the 123rd minute, Wambach collected the ball in the middle of the field. She found O’Reilly on the right wing, who played a first time cross toward the middle of the box. Morgan outjumped to beat the Canadian keeper with a header for the late winner. This game is an instant classic, and was hard-fought by both teams. The Americans showed their grit as they continued to fight for the tying goal each time they went down. They have shown that they should never be counted out of a game. The Canadians may have lost a heartbreaker, but they too believed in themselves until the final minute, and will continue to be a factor in major women’s tournaments in the coming years. The US will face Japan in a rematch of last summer’s Women’s World Cup final in the gold medal match on Thursday (2:45pm, NBCSN, Live Extra). The US showed against Canada that their defense is their weak point, though that might not matter if they continue to find the back of the net. The Americans seem to have a flair for the dramatic in big games, and we should expect nothing less against Japan with a gold medal on the line. Literally the tuck rule part 2.